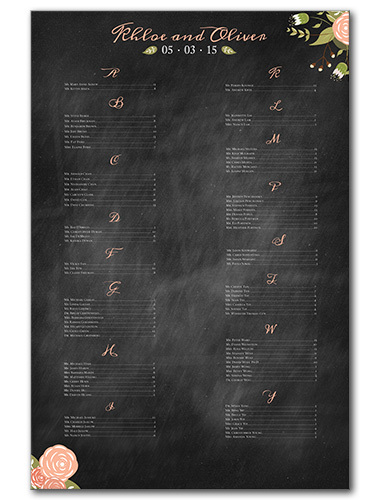 Go with something a little different from the norm with our Adore You seating charts. These striking cards offer a black backdrop with white swirls, giving the appearance of a recently erased chalk board. This adds a playful touch for any couple, but also makes these an ideal option for teachers who want to pay homage to their profession in their celebrations. Pink flowers and foliage adorn opposing corners, presenting with a cartoonish effect that only adds to the fun design. Customize with your wedding font and information. Comes in both invitations and save the date cards for a coordinated touch. Adore You Seating Chart For the best experience, we recommend personalizing your stationery on a desktop computer.